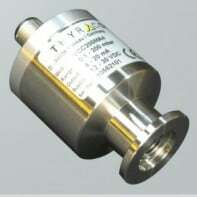 The VCC200 capacitance vacuum transducer is used for measuring absolute pressure with high accuracy and independent of gas type even below 20 mbar. Due to its durable ceramic sensor it is nearly insensitive to dirt and contamination. Measurement is independent of gas type. Robust metal housing with protection class IP54. Vacuum connection over a stainless steel small flange DN 16 ISO-KF with G1/4 female thread.